A segment we have done on our podcast for about a year now is called "Baseball on TV." During this segment, we highlight one baseball themed episode of a TV show. Some of my past favorites have included Psych, Cheers, The Simpsons, King of Queens, and 30 Rock. You can search #baseballontv on Twitter to see all of them. For the past month, we have focused on the best show of the 90s, Seinfeld. 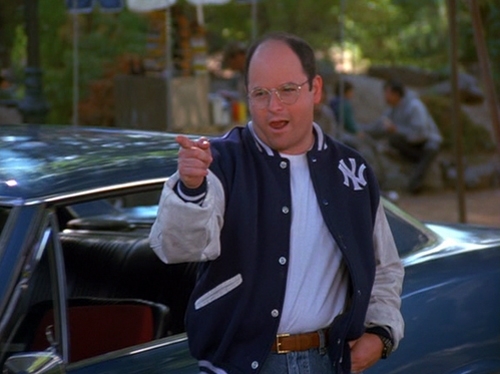 Tomorrow's episode will be the fourth and final installment of Seinfeld #baseballontv. Below are clips from the four episodes we discussed. Seinfeld fans, please let us know if you think we missed a great baseball moment from the show. And if we did, it was all Paul's fault. Season 5, Episode 21: "The Opposite"
Season 7, Episode 5: "The Hot Tub"
Season 7, Episode 4: "The Wink"
Season 3, Episode 17: "The Boyfriend"